History/Mythology: Sometime in the 18th century, Venetian glass blower/workers accidentally dropped some copper filings into a batch of molten glass they were surprised to discover that this produced shiny sparkles within the glass once it had hardened. It is the similarity in look to this event that first gave Aventurine name. A similarity was seen between the glass and the stone, the name Aventurine then came into use which is from the Italian word ‘aventura’ which roughly translated means ‘by chance’. 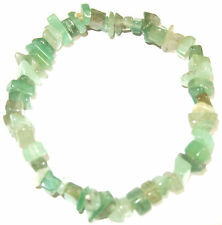 Green Aventurine is considered the ‘Stone of prosperity’ and has long been used as a good luck talisman and has always been popular with people who fancy a game of chance. It has a very strong connection to the Devic kingdom and is therefore great to use in gardens or for gardeners. It is a protective stone that helps to block any electromagnetic emission from electrical appliances. It also does a great job of defusing all negative situations and helps to turn them around so that they are more positive. 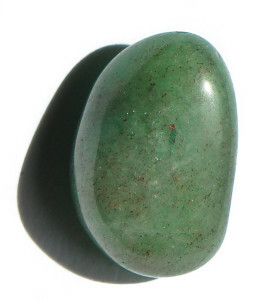 It is a very calming stone and through its connection to the heart chakra allows you to live more from your heart and makes you feel more at peace with your situation and who you are. By opening up your heart it allow leadership strengths to come forward and the wearer to become a more decisive decision maker. Healing – Benefits thymus gland, nervous system, balances blood pressure, relieves migraines, soothes eyes and skin eruptions. Green Adventurine is great to place in the top of pot plants to give them an energetic boost. Place around the house to generally improve the energy. Worn as jewelry is a great good luck and protection talisman.